Look who moved in at Rooted! Last week a few new additions moved into our clinic. We have 8 stuffed animals we call “Stuffins” that you can choose from to snuggle up with during your treatment. Much like stuffed animals may have provided comfort to us as kids; Stuffins could provide you with added comfort during your treatment as well. It might be surprising to some, but stuffed animals are used by many for PTSD, depression, and anxiety. 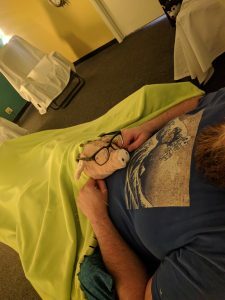 Although we’ve had a few people feel silly at first, they immediately find that they like the added comfort they provide. If you feel a little silly, we can cover up your Stuffin of choice with your blanket. But also keep in mind Rooted is a judgment-free zone. Even I take some time out of my day to get some stuffin’ snuggles in. If you have a favorite stuffin’ of your own, feel free to bring it along for your treatment, they are always welcome. 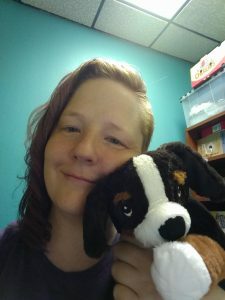 There is a lot of information out there on stuffed animal use for therapeutic purposes. We like this one My Stuffed Little Therapy.